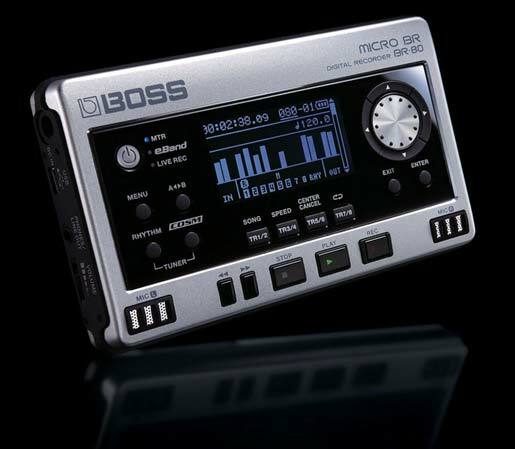 Shop Boss Micro BR80 Portable Digital Recorder from AMS with 0% Interest Payment Plans and Free Shipping. Built in microphones, multi-track recording, jam along tracks and so much more! 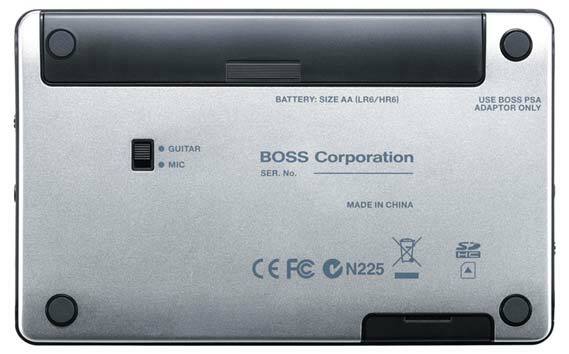 The Boss Micro BR-80 Portable Digital Recorder is the ultimate pocket-sized recording and jam-along tool for guitarists and other musicians. 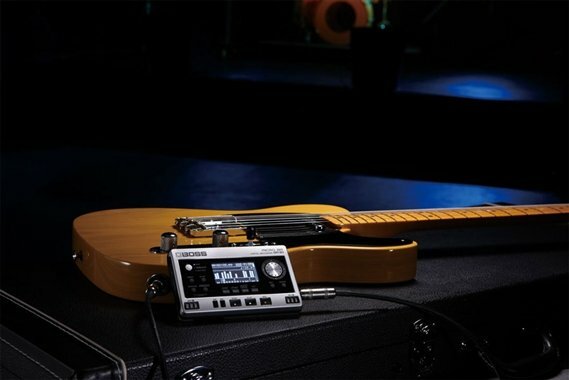 The Micro BR-80 is equipped with three modes to create, record, and perform your music: an 8-track Multi-Track Recorder mode; an eBand mode for onstage backing tracks and phrase training; and a Live Rec mode for instantly capturing high-quality stereo recordings. You can even combine the three modes seamlessly with the BR-80. Record your phrase ideas using Live Rec mode, for example, and then import the recordings into Multi Track Recorder mode to use as foundations for song production. Once you've added tracks, import your finished songs into eBand mode for backing-track accompaniment at the gig. 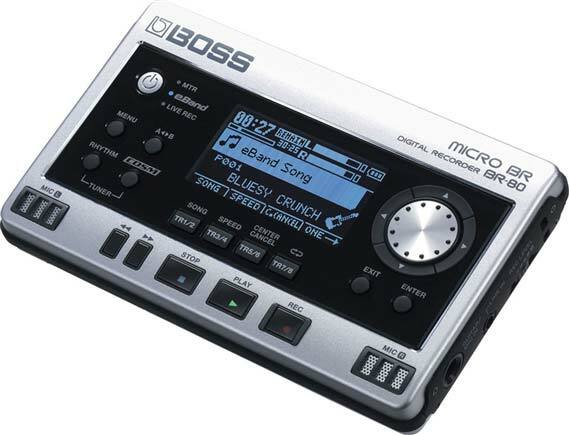 Musicians of all types can find a use for the Boss Micro BR-80! Don't be fooled by its size, the Micro BR-80 is loaded! The Multi-Track Recorder mode offers 64 V-Tracks with eight simultaneous playback tracks. In addition, a dedicated stereo rhythm track is provided, as well as an onboard library of great grooves to choose from. The intuitive user-interface continues the simple-to-use tradition of Boss' acclaimed BR series, with a graphical design that follows the layout of a conventional recording console. With EQ, reverb, and mastering tools plus, world-class COSM amps and effects for guitar, bass, and vocals the Micro BR-80 is ready to deliver complete, pro-quality recordings with ease. 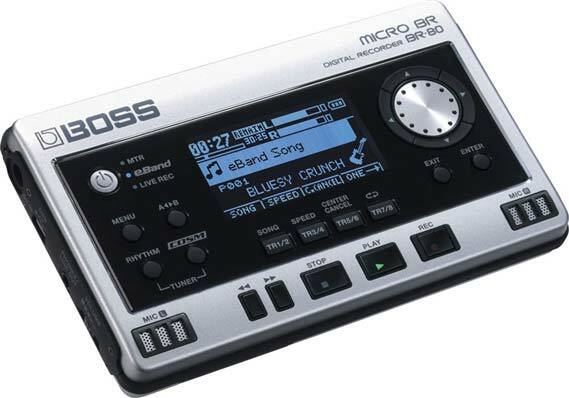 The Boss Micro BR-80's eBand mode offers musicians a fun way to play along with their favorite songs. With the bundled eBand Song List Editor software, you can import CD, MP3, and WAV audio files from a computer via USB. The Center Cancel function can be used to minimize the volume of pre-recorded vocals and solos for play- and sing-along enjoyment. eBand mode is also an excellent partner for musical training, as it lets you record your performance adjust playback speed and/or pitch as desired. In combination with the onboard high-grade stereo condenser microphones, the Micro BR-80's Live Rec mode lets you capture pristine stereo recordings instantly. Record vocals, guitar parts, and song ideas the moment inspiration strikes. 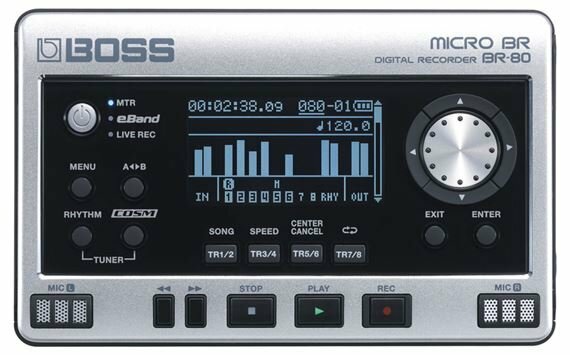 Your recorded audio files can be easily imported into the Micro BR-80’s Multi Track Recorder mode to use as a basis for multi-track song production. The Micro BR-80 is packed with professional multi-effects powered by a newly developed custom DSP chip. Over 40 types of Boss COSM amp models give you instant access to a wide range of powerful guitar and bass sounds. The preset patches allow first-timers and pros alike to enjoy high-quality sounds immediately, while power users can tweak parameters in micro detail for the ultimate tonal control. The dedicated vocal effects, comparable with Boss’s popular VE-20, include doubling, harmony effects, pitch correction, and more. 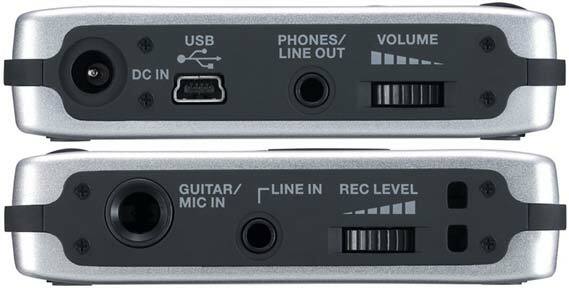 The ultra-flexible Micro BR-80 can be used as a stand-alone digital recorder or as audio interface for a USB-equipped computer. Giving users a full-fledged PC-based music production environment with latency-free recording and a powerful range of Boss COSM amps and effects. Furthermore, the bundled Wave Converter software lets you easily exchange data between the Micro BR-80 or any other DAW. * May vary according to usage conditions, batteries used, and type of SD card used. Drums need a little help but once you rtfm this thing is pretty powerful. Great for laying songs out. Cant wait to import some drum samples into it. Overall having a blast good sound qualitu. Has a learning curve but alot of power for under 3 bills. It does work with windows ten. The other review on here must be old. This thing is great. I use it everyday. It is the perfect practice tool. Want to learn a song just record it,you can slow it down speed it up.change the pitch. Loop it.theres a drum machine on board and a metronome. It comes with jam trcks.But i recorded over 300 from free backing tracks.com. so i can plug in put my headphones on and jam all day. And it lets me record my guitar over the backing track and it sounds great. If your learning a song in a diffrent tuning you can just change the song to match your guitar instead tuning to the song,and it saves a lot of time. Over 150 presets and you can save anouther 100 your self. Its also a multi track recorder that sounds just as good as the br800. And its a field recorder. So if your learning to play or you just want a great tool to jam private with a ton of options. You cant go wrong. I had this for over a year i use it everyday and im still finding new ways to use it. I travel around the world all the time and used to find this was a very versatile albeit slightly not user friendly Swiss Army knife. It used to sound great but now its unuseable since it does not connect to Windows 10. Roland are giving me the run around saying they are working to update some of their products to Windows 10. They point me to a website that lists Roland gear but this BR80 is not even on that list. So now 2 months after Windows 10 official release and 2 years since they started their Beta program so that these things would not happen I own an expensive brick. So I am currently extremely disappointed in Roland. Great device for getting ideas down! i own the boss gt10 and this is just a little version of this pedal board, but with recording and drum samples galore!!!! best recorder i have ever seen. you can lay down full tracks with millions of layers. i use this to write full songs for a project im working on so when i present it there is no guess work at all to do. excellent for catching ideas and working out song structure. If you can't write a song on this you probably can't write a song at all. Amazing!!!! Best fun in a small package! The bottons and dial feel very well made. The unit is actually mainly made of metal and only uses plastic for doors, faceplate, and accent pieces. Button presses are great...the dial is ok...but I think they could do better with a roller on the horizontal like a mouse wheel but wider with more of a tactle click or notch. The backing track sold me first and formost...all the tracks that are found in the E-Band are inside...plus a few I downloaded from the website to teach riffs with backing tracks. The recording is top notch...punching in and editing tracks is waaaay easier than some other portable recorders out there. The multitude of options in this thing is amazing! The built in mics do an excellent job of capturing both you and your guitar. The cool thing is you can monitor through head phones at the same time...so you know exactly what your recording! Once you read through the manual...it's easy as pie. The interface is well thought out and when searching for songs, backing tracks, and tones...it's file structure is awesome!